It can become costly for small and medium sized businesses to issue their own overdue notices, especially as they begin to pile up. The Finance Charge Invoice Template is a simple Excel template to track overdue notices and send them to consumers. Download the template using the link below to open the Excel sheet. The one page finance charge layout is set up for you to just fill in the blanks. Begin with [Your Company Name] and [Slogan]. Next to this is where you will reference the date, invoice number, and customer ID you are billing to. The column underneath is for the consumer’s billing and shipping address. Beneath that is the job that was performed, and the payment terms established. The default is “due on receipt” but change it to whatever payment plan you agreed on. The column follow this is where you enter in the overdue balance numbers and any invoice charges and amounts. You can delete excess lines to make the paper smaller. Below, the total will automatically calculate for you. The last little bit is for your company information so your consumer can contact you. You can also add hours of contact and a name to ask for when calling. 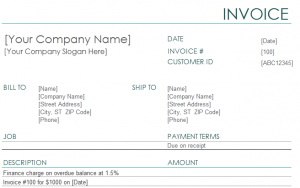 Keep a digital and printed copy of this invoice for yourself and for your customer. It’s best to have as many resources for everyone as you can. Always fill out this invoice on the computer. Handwritten invoices can altered and lead to fraud or disputes. Bad hand writing is also an issue. Attach the original invoice to the invoice overdue balance invoice to establish that the charges are legitimate.